This rich, flavorful, filling, very fall-ish salad was inspired by a dish that has lingered in my memory since I had it earlier this year at a Detroit restaurant called Dime Store (I did a post on my brunch visit to that establishment on my other blog, 100 Places in the D). That salad, called the Sweet Poached Pear salad, had the namesake poached pears, spicy pepita seeds, and shredded fontina (which I substituted for its usual goat cheese). The similarities of that salad with this Prosciutto, Pear, and Fontina Arugula Salad with Roasted Squash and Spicy Pecans end there; it had mixed greens, cornbread croutons (which were fantastic! Note to self to include those in a future recipe), onion, fennel, and a bacon vinaigrette dressing. But I wanted to pay homage to it here, because it’s what inspired the combo of pears, fontina, and spicy roasted nuts. With the Prosciutto, Pear, and Fontina Arugula Salad with Roasted Squash and Spicy Pecans, we’ve got a restaurant-level salad we can make in the comfort of our own homes, people! I know I’ll be wanting to leave my home less and less once winter sets in. It’s still surprisingly warm here in Metro Detroit; we had a dip in temperature last Monday, and then we had highs in the 60s and 70s the rest of the week. It was gorgeous yesterday, in the high 70s. I am LOVING it but know the temps will inevitably dip for good and with it, my energy levels and my motivation to go out when it’s dark at 6 p.m. Instead I’ll be wanting to cozy up in my sweatpants and eat this Prosciutto, Pear, and Fontina Arugula Salad with Roasted Squash and Spicy Pecans while guzzling wine and catching up on This is Us (which I typically binge-watch a few epis at a time because I HEART that show, but man, does it tug on my heartstrings! I gotta be in the mood for a major catharsis every time I view that one, it’s so emotionally vibrant). Sounds like the perfect night in to me! And if I’m wanting to drop the whole hermit vibe and invite a few friends over, I know my Prosciutto, Pear, and Fontina Arugula Salad with Roasted Squash and Spicy Pecans can be the sophisticated entree I need it to be, whipped up in no time once I’ve done the proper prepping. The biggest prep work that needs to be done, really, on this salad is roasting the squash, which takes about 45 minutes. 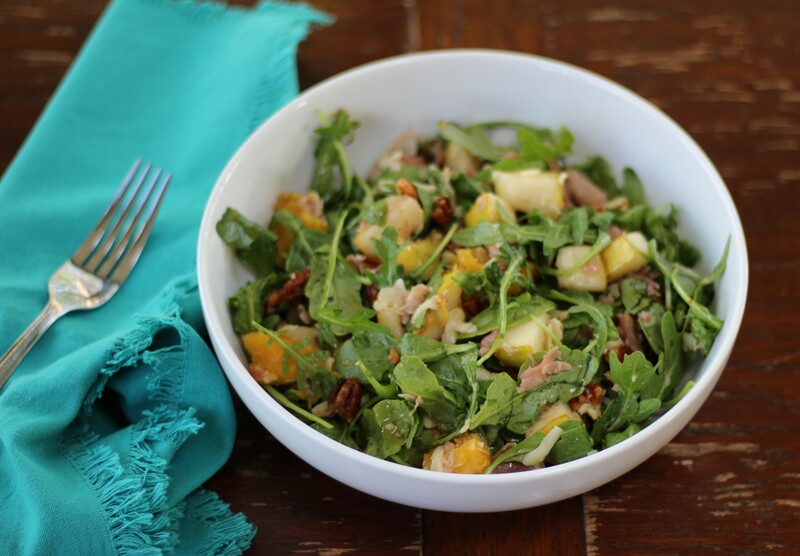 That’s something I find I can easily do in the morning before work or the evening prior to wanting to make this Prosciutto, Pear, and Fontina Arugula Salad with Roasted Squash and Spicy Pecans. The pecans take under 15 minutes to roast, and the prosciutto only about five minutes or so to brown in a frying pan. The dressing is throw-three-ingredients-in-a-mason-jar-and-shake – and voilá! there’s your maple vinaigrette dressing. Beyond that, it’s basically tossing all of the ingredients together just prior to serving, and this beauty of a salad is born. So whether you’re a party of one, two, or a whole gaggle of guests, this Prosciutto, Pear, and Fontina Arugula Salad with Roasted Squash and Spicy Pecans will amp the sophistication status of your soiree – and taste frickin’ amazing while doing it. Go with your bad self, Prosciutto, Pear, and Fontina Arugula Salad with Roasted Squash and Spicy Pecans, you life of the party, you! Ok, it’s the most important part of the post now: on to the recipe! 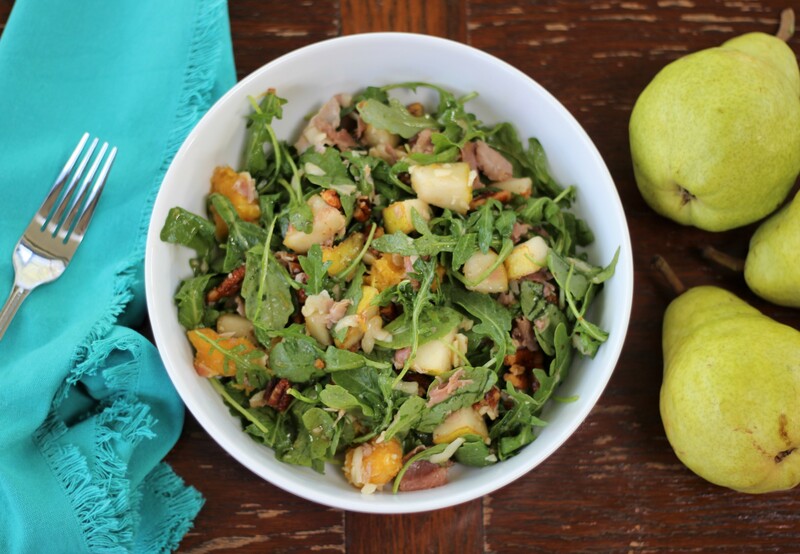 Juicy pears pair well with rich fontina and prosciutto, peppery arugula, savory squash, spicy pecans, and maple vinaigrette dressing in this hearty salad. Preheat oven to 400 degrees. Place squash halves cut-side up in an oven-safe baking dish; add cubes of butter to the hollow of each. Sprinkle with salt and pepper. Roast until flesh is soft when pierced with a fork, about 45 minutes. Remove from oven and let cool. Once cooled, cut one cup's worth of cubes roughly a half inch in diameter from the flesh of the squash. Set aside. Once the squash is done roasting, reduce oven heat to 350 degrees. Toss the pecans in the melted butter, cayenne pepper, and salt and spread evenly across a baking dish or cookie sheet. Let them roast for six minutes, then remove them and stir; roast for an additional six minutes. If toasted to your liking at this point, set aside to cool; if not, return to the oven and keep checking them every few minutes until they are. Add the chopped prosciutto to a frying pan over medium heat and cook until browned (about five minutes), stirring frequently. Remove from heat and place on a plate lined with papers towels to drain any excess oil. Now it's time to assemble the salad! 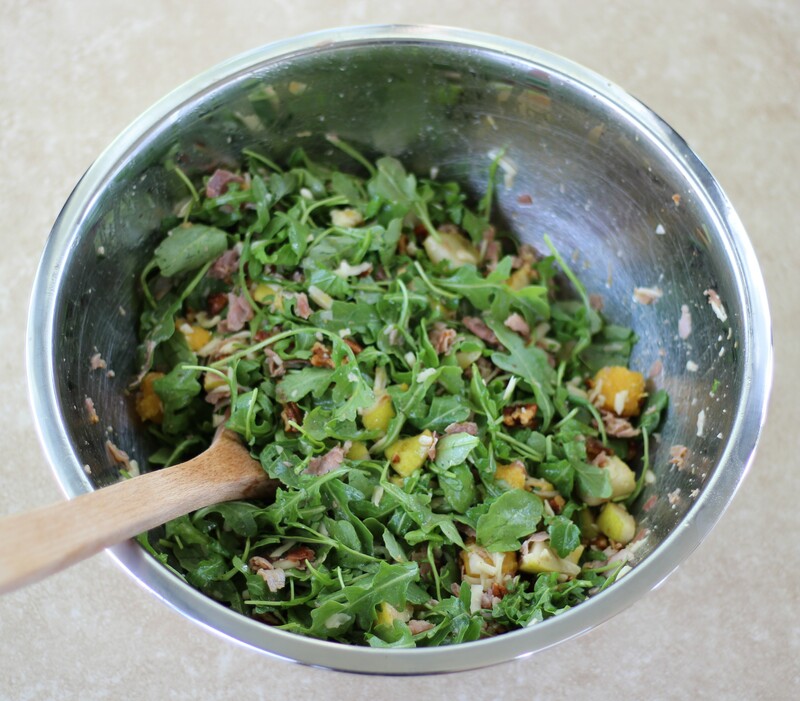 In a large mixing bowl, toss the arugula with the pecans, prosciutto, pear, cheese, and cubed squash. To a mason jar or other container with a lid, add the olive oil, maple syrup, and balsamic vinaigrette. Close lid and shake vigorously until all ingredients are well combined. Pour desired amount of dressing onto salad and toss well. And you're done! You have a sweet, spicy, savory, satiating salad to enjoy!